I got my mojo back after my little break by making an Ipad case yesterday. My friend has no idea that I am making this for her, but I can't bare to see a nekkid Ipad. The main blocks are all sewn together and I am now pondering borders, for unknown reasons I seem to be struggling with making decisions with this mini. I am thinking a skinny border of the solid orange and then one of the Summersville prints. This is my today project, well it will be once I've made my mind up. After trying for the last week to get a decent pic of the Bloom quilt top, I have finally admitted defeat and so am posting the best of a bad bunch. I am planning on basting this at the weekend as my roll of wadding lives at my Parent's house. I have some of the extra wide Moda dotty in the grey for the backing. I still have my EPP to finish, I am miles behind in the projects for the Stitched in Colour Hand stitched class. 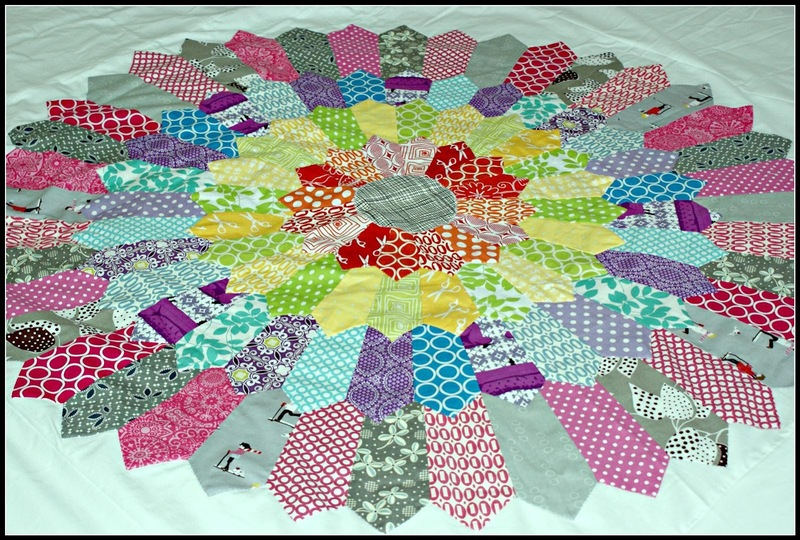 I am linking up to the Freshly pieced WIP Wednesday. Love that ipad cover! The dresden looks fantastic on the newspaper print. Gorgeous! I like the idea of a skinny orange border then the Summersville print - it sounds like a good plan to me! What a wonderful ipad cover! And a skinny orange with the bottom Summersville is what I'd be doing! Look forward to seeing how it develops! Super fabulous iPad cover!! And I love your mini, skinny border then Summerville sounds great! Your bloom is really stunning!! Look at you go! I love that ipad cover - I want it! That newspaper print is gorgeous. Your mini is looking the goods and I can't wait to see your Bloom done. It is all looking fabulous. Really love the Walk In The Woods dresden - so pretty! Yay, yay, yay! I love your rainbow bloom and the polka dot fabric is so perfect for the back! We've had dreadful lighting here lately too, it has rained every day for the past two weeks! Your block for the swap is awesome. I love the pattern it creates when they are all together. 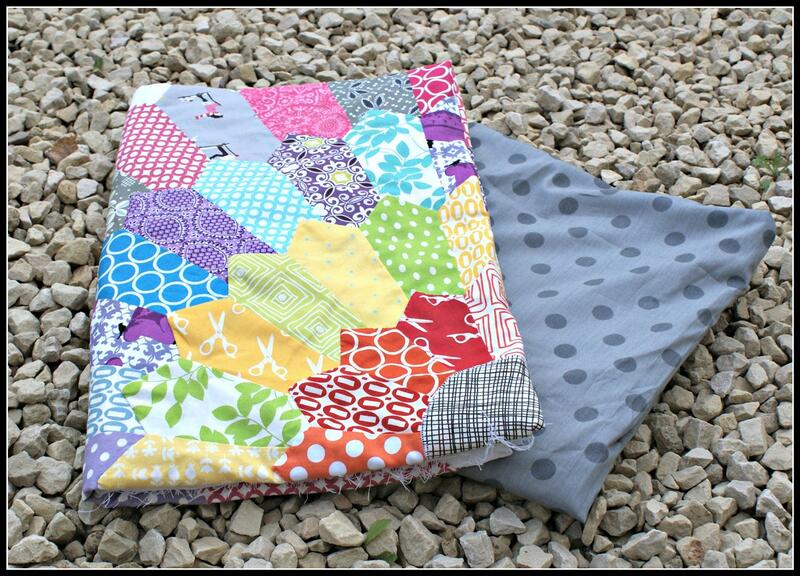 I can't get enough of that newsprint fabric, it looks so good with your dresden! Very cool Dresden & I love your Brit swap block! I love the ipad cover - what a great present! Bloom is looking splendid, as is your BQS mini! Oh gosh if I ever get an ipad I'll be asking you to make me a cover! beautiful! Gorgeous! That Bloom quilt is something else (and a total credit to your willingness to be patient)- how will you quilt it? Love your bee block too. Wow! 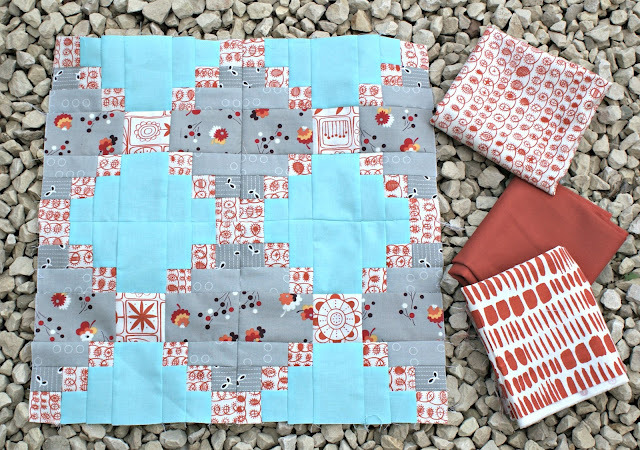 The bloom quilt is just lovely! Everything is beautiful! Your bloom quilt is just perfect and I love the gray backing! Love all your projects! The iPad case is awesome, your friend better appreciate it! PS I read your next post and think you chose the right fabric for the border of the mini quilt. Looks great! Love the ipad cover! And that bloom top is quite impressive. Those are a lot of blades! Ariston and on, and on - da da da!